When I design a kit, I normally do whatever I feel like doing, then find photos that will work with the kit I just created. This time, I went backwards, choosing the photos first (of course, the photos of the hat I just knit for Max, because I can't resist his dimple), then creating the kit from the photo. 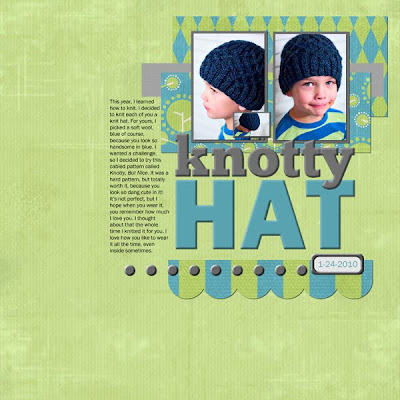 I really enjoyed creating this way, and I think I will do a kit for each of my children. I could not think of a name for this kit, so I finally came down to calling it "The Max," which fits it nicely and neatly takes care of thinking of names for the rest of the series. If you haven't noticed, titles are not a strength of mine. I LOVE this Kara!! You really inspire me! Thank you so much for this Freebie. 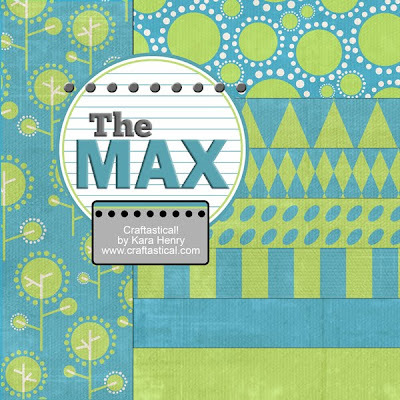 I want to let you know that I posted a link to your blog in CBH Digital Scrapbooking Freebies, under the Page 13 post on Feb. 02, 2010. Thanks again. THANK YOU!! Your kits are awesome. I love the colors of the kit! How cute!